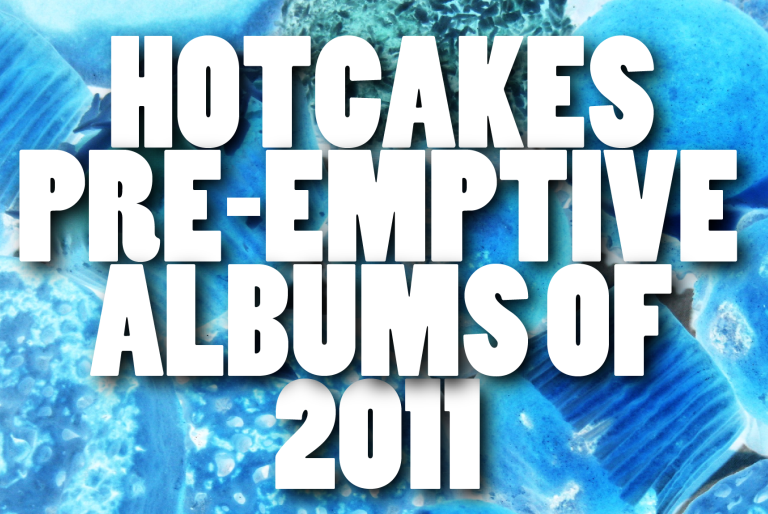 Already preparing to eat these words, Hotcakes have come up with a pre-emptive top 10 albums list of 2011. This a ‘calling-it-early’ stab in the dark that will probably make us look like idiots come December, but there’s nothing wrong with a bit of speculation from time to time. Surprising us all last week, Tunde, Dave, Kyp and co. are preparing for a spring release. Having not heard any content at all yet, this could be seen as a risk. However, on listening to Dear Science and Maximum Balloon, this actually looks like a pretty good choice. They have sprung it on us all of a sudden, lets see what other surprises they got coming. A pretty standard choice for third place here, with the band’s sophomore album due out on May 3rd. We’ve already heard the first single, and it is at the very high standards you come to expect, so expect critical acclaim for the album. “Oh he’s fallen off”. “Eurgh, he’s too old”. “‘I Need a Doctor’ is a Recovery b-side”. These are all phrases being bandied around at the moment in the build up to Detox’s eventual release. Fools, the lot of you. Dre will blow us all out of the water with this, trust me. Yes, a lot of brilliant artists go a bit stale after twenty odd years in the business, but that’s normally because they’ve released about 9 albums and everyone is bored of them. But it’s easy to forget this is only the Doc’s third album. He’s got something huge up his sleeve. Another no brainer, but for obvious reasons. Again, we’ve heard the first single, which was met with general exaltation. People are going crazy for the use of not one, but two catchy choruses and the return of some trademark guitar work by Albert Hammond, Jr. They’ve even gone back to reducing the prominence Casablancas’s vocals, which suggests a return to the sound that got them noticed in the first place. Expect great stuff on March 22nd. The boys from Sheffield announced this one last month with a provisional spring release. They’ve announced colossal Sheffield dates in June, as well as a number of festivals, it is looking very likely we’ll hear this album this year. Humbug’s success carried on from their first two albums, and it would take a big fall from grace for this to fail. Another brave one, with not a lot of news coming yet from Justin Vernon, but if he releases his second album this year, some fantastic folky music is expected. I’m hoping for a more earthy sound, like that of his debut, in preference to the processed style of his Blood Bank EP. That’s not the title of the album by the way. In admittance, this is a very dodgy call. They have only just announced a brief comeback tour, and they’re in our pre-emptive top 10 albums? But we all know how much we want this. If they do a second album this year, then it has to succeed. Their unique music is so infectuous, and they are so good at making it. Come on DFA, follow up the tour with an album! The only artist in the list who’s album is already out, we’ve had quite a bit of time to digest this one, and it’s safe to say that it’s lived up to his EPs. This is bound to be high up, and he’s going to go from strength to strength. I cannot wait to hear something from this ever-reliable rock band. They never fail to disappoint. Up until 2007’s Icky Thump, they have released an album every other year pretty much, so we’re bound to hear some new material from them soon. Wait, what? They WHAT?! Oh. Ok, we’ll give the number 10 spot to Lady Gaga I suppose. Depressing. On looking back at this in December, I bet we’ll look like such half-witted imbeciles. Oh well. This entry was posted on 14 February, 2011 at 5:28 pm and is filed under Downloads, Features, Stream, Uncategorized with tags Arctic Monkeys, bon iver, death from above 1979, dr dre, Fleet Foxes, James Blake, most anticipated albums of 2011, outkast, Pre-emptive 2011 list, the strokes, the white stripes, TV on the radio. You can follow any responses to this entry through the RSS 2.0 feed. You can leave a response, or trackback from your own site.